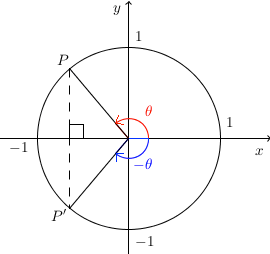 In order to understand the proof below, you must have a prior knowledge about circular functions. The proof also uses symmetry which is I think quite basic for high schools students. The basic idea is that the point is symmetric with the point with respect to the axis. The angles and are rotations with the positive x-axis as the initial side. The angle is a counterclockwise rotation and the angle is a clockwise rotation as shown by the arrows in the diagram below.